The Competition Specialists Auto Club (CSAC) was formed by eight young hot rodders in 1954 under the name of the Tappet Tickers Hot Rod Club. 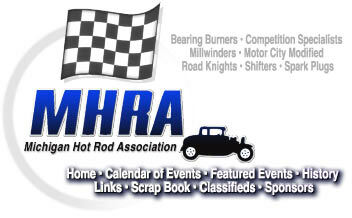 In 1955 the club became an official sanctioned club of the Michigan Hot Rod Association (MHRA). The name was changed to CSAC in 1964. We have been very active in the operation of the MHRA. Members helped build the MHRA drag strip which opened in 1957. We’ve been a long time supporter of the Detroit Autorama with various members serving as chairmen and co-chairmen of the show. Many of the club members were award winning participants as well. We were responsible for initiating the MHRA Rod Repair Shop at the NSRA Street Rod Nationals in 1972, and for leading the construction of the Rod Repair Shop trailer which debuted at 1973 NSRA event in Tulsa, Oklahoma. The Rod Repair Shop is in its 38th year of service and has been supported with workers and leadership from the club since 1972. When the street rod activity began to emerge in the late 1960’s our members initiated the first MHRA Pre-War Rod Run and continued to work on rod tour committees for many years. CSAC members have also been very active in drag racing. They held many strip records during the early days at the MHRA drag strip. They also won various classes and set both elapsed time and top speed records at the NHRA National Drag Races in Detroit, at Indianapolis and various other venues during the 1960’s and 1970’s. Other activities that we have initiated, conducted, and participated in over the years include lawn shows, swap meets, MHRA demolition derbies, and numerous other motorsports events.